Our synagogue is more than a building, school or set of programs. Or Chadash is its membership, pure and simple. Our members come from all over, and represent a broad spectrum of Jewish thought and practice. With our membership, we commit ourselves to a journey of discovery, where each of us, in our own way, deepens our connection to Judaism and ties to Israel. 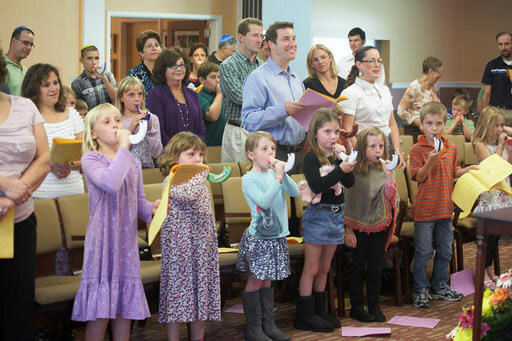 Some of us will discover greater Jewish meaning in Adult Education classes; some with new friends on an excursion to explore Jewish culture in our region; some with the knowledge that their children are learning to love Judaism in our religious school, some from worship and singing; and some through acts of Tikkun Olam (Social Action). Or Chadash supports a wide variety of Jewish creativity. Join us and we’ll help you discover your unique path. The Hebrew term for synagogue is Beit Kneset – Home for Gathering. Some refer to a synagogue as a Beit Midrash – a Home of Study or a Beit Tefillah – a Home for Prayer. By forging your own Jewish path with us, we can create a home together that honors all of the meaning and hope in our name: Or Chadash – New Light. Join us for Shabbat or an event that interests you to meet the members and the Rabbi. Please take a look at our pictures and newsletters to get a sense of our community or review personal stories from our members writing about their Or Chadash experiences in our Legacy Circle Book of Life. Learn more about our Religious School where we teach from tots to teens. This membership level is available for singles only who are 34 years of age or younger with no children. A High Holy Day ticket is included for this individual only. Dues for this category are $360 plus the “Young Membership” Building Fund Pledge. This membership level is available for couples in one household with or without children in which the oldest adult is 34 years of age or younger and no child is over the age of 4 years. Two High Holy Day tickets for the couple are included. Dues for this category are $618 plus the “Young Membership” Building Fund Pledge. This membership level is for a one adult household, in which the adult is over the age of 34 with no children. One High Holy Day ticket for the individual is included. Dues for this category are $1,160 plus the Building Fund Pledge. This membership level is for couples over the age of 34 with no children residing at home. Two High Holy Day tickets for the adult couple are included. Dues for this category are $1,995 plus the Building Fund Pledge. This membership level applies to a one household family with one or two adults and at least one child. Two High Holy Day tickets for the adult couple are included. Dues for this category are $2,235 plus the Building Fund Pledge. This membership level is for adults 65 years of age or over. One High Holy Day ticket is included. Dues for this category are $405 plus the Building Fund Pledge. This membership level is for couples 65 years of age or over. Two High Holy Day tickets are included. Dues for this category are $795 plus the Building Fund Pledge. All members of Or Chadash are required to make this pledge. A. Young and Senior Membership (Membership categories A, B, F and G): $100 per year. Monies collected while in the Young Membership level will go toward the $2000 when you move into the next membership level. B. Adult and Family Membership (Membership categories C, D, and E): $2,000. This commitment can be fulfilled in either a single payment or in equal installments of $500 over the first four years of membership. Please note that this is in addition to the standard annual dues and fees. This amount will be included in your billing. Click here for the Or Chadash 2018/2019 New Member Registration Form. Click here to register for Religious School Only. Dues are a sacred obligation between members and the congregation as a whole. All members have a responsibility to keep Or Chadash on a sound financial footing. However, we realize that extreme circumstances may require a congregant to make special financial arrangements for the payment of Temple fees. Because we cannot anticipate all circumstances, we accept requests for dues consideration. Please contact Debbie Weiss, President, or Jeff Berg, Treasurer, to discuss your circumstances confidentially. Our policy is never to deny membership at Or Chadash to anyone because of financial hardship. For more information, please feel free to call us at 908-806-2122 or send us an email.